Objective of visit: To survey the Tarapaca Valley for the remains of ancient human activity and to study a selection of these in detail. Fellow visitors: Faculty and students of the University of the UCLA Tarapaca Field School, co-directed by Dr. Ran Boytner, Dr. Ioanna Kakoulli and Dr. Maria Lozada (University of Chicago), in cooperation with Dr. Mauricio Uribe (University of Chile) and Dr. Charles Stanish (University of California, Los Angeles). 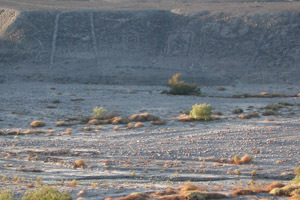 Large areas of the desert (pampa) on either site of the Tarapaca Valley appeared to preserve many geoglyphs and other structures of yet unknown date and function. Measurements were taken to produce topographic maps of Site 1024, above Huarasiña, and Site 40, below Casarones. 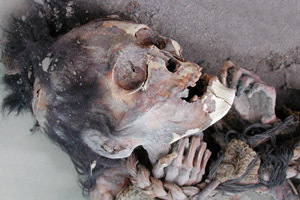 At both sites several burials were excavated. Excavations also took place at Tarapaca Viejo, most likely an Inka settlement, and at Carora. Additional ancient remains, including possible Inka trails and fortifications, were seen further to the east, higher into the valley. Approximate position and date of the site: The Tarapaca Valley is in the most northern part of Chile (Region 1, bordering with Peru and Bolivia), inland of the modern harbor town Iquique. Dating of the finds and structures remains difficult, but they seem to range from at least 300 AD to present. Short description of the site: A number of deep canyons are cut into the extremely arid Atacama Desert by water running of the Andes. Most of these rivers run dry before reaching the Pacific Ocean and appear as elongated oases, well below the surface of the desert proper. These fertile regions have most likely supported human occupation for a very long time, but were certainly part of the long distance trade network between the coastal areas and the Andean highlands (altiplano). My work in Chile would not have been possible without the Cotsen Institute of Archaeology.